Duncan Hall has a variety of public spaces, including Martel Hall, McMurtry Auditorium, two lecture halls, and three classrooms. The Office of the Registrar (116 Allen Center) is responsible for scheduling the two lecture halls and three classrooms. To reserve a lecture hall or classroom, see the online reservation request form or call Chris Higgins at x8026. • Faculty and staff with offices in Duncan Hall have priority in the scheduling of conference rooms and public spaces in the building. Reservations by others are permitted, but require a Duncan Hall resident faculty or staff sponsor to reserve a room or public space. • No functions that include music or loud noise will be scheduled in Martel Hall before 7 p.m. on weekdays. Requests for events that would have music or loud noise after 7 p.m. on weekdays or at any time on weekends must be approved by the Dean’s office. The proposed use of music, microphones, loud speakers, etc., must be so noted in the initial request. • Balcony usage is on a first come/first served basis and is reserved for Engineering events only. • Our goal is to keep disruption of our students, faculty and staff to a minimum. First and foremost, the purpose of Duncan Hall is to support education and research. We ask that every attempt be made to schedule special events on Saturday or Sunday evenings and that no such special events be scheduled during the last three weeks of each semester. • Room 1003 is the Dean of Engineering’s conference room. It cannot be reserved in advance. Last-minute use of this room in emergencies is possible, pending approval from the Dean’s office. Call the front desk in the Dean’s suite at x4955 to make a request. • To reserve the following conference rooms—1044, 1049, 2014, 3110, 3076 or 3092—please submit requests using the on-line reservation system. • Room 1049 is to be used primarily for site visits and guests from industry. (Other types of meetings scheduled for 1049 may be subject to displacement). • The only courses that may be scheduled into conference rooms are seminar courses (as designated in the Registrar’s schedule of courses) at the 600 level or higher. No courses may be scheduled in DH 1049. Any course scheduled in a DH conference room may be displaced by a site visit. 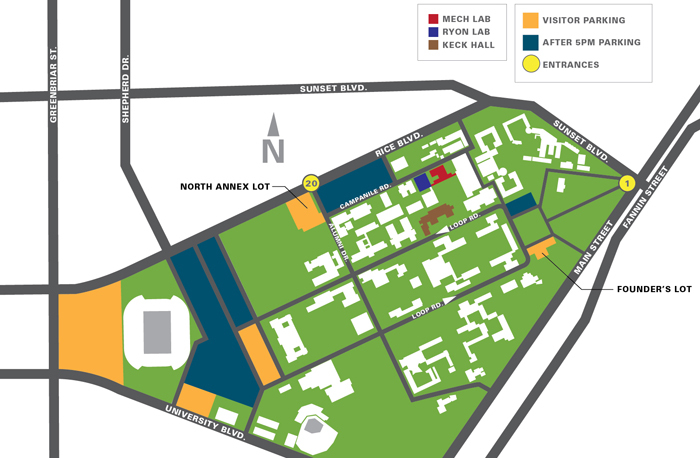 • Arrangements for audio visual equipment and/or support in McMurtry Auditorium or any of the room in Duncan Hall must be made by the person who requests to use the space. AVS requires a minimum of three days advance notice. • If tables are needed for an event, it is the responsibility of the person who makes the request to arrange for tables. • Food and drink are allowed in most spaces in Duncan Hall. However, food and drinks are not allowed in the auditorium, classrooms, or computer lab. Additional rules for classroom and computer lab use may be found on the web page of the Office of the Registrar. Users must clean rooms and remove all garbage immediately after their meetings. Garbage should be placed in the brick trash enclosure at the northeast end of the building (outside the service door). Alternatively, arrangements can be made with the building custodians to clean meeting areas. It is the responsibility of the person who reserves the room to clean the room in a timely fashion or make arrangements with the custodians to do so. • No rollerblades or skateboards are allowed in the building. • Music, speakerphones, etc. should be kept at a volume that does not disturb other occupants of the building. • No signs or announcements can be posted on or attached to any windows or painted surfaces in Duncan Hall. Logistics arrangements for events in Duncan Hall are the responsibility of the person who makes the room request and/or the hosting department. Logistics include securing classrooms or conference rooms, AV, IT, rentals, catering, FE&P, parking, RUPD, event staffing and more. Please understand that your department will need to bear any costs associated with your event’s logistical arrangements. Facilities and Engineering and Planning works in many areas including lights, temperature control, custodial, etc. A Rice faculty or staff member must submit a work request at http://facilities.rice.edu/ for event related help, including, but not limited to the items listed below. Custodians are on site Monday‐Friday until mid afternoon and only provide routine custodial support for the building, not events. There are no custodians on site on the weekends. Clean up—Room users must clean rooms and remove all garbage immediately after their meetings. Garbage should be placed in the brick trash enclosure at the northeast end of the building (outside the service door next to the loading dock). Room users must submit a work request for additional support, restroom monitoring and/or additional trashcans and liners if you expect to exceed the normal custodial level. Leftovers may be neatly placed on the counter of Sid’s Place coffee Lounge during the day. However, no food related items are to be left in the building after normal business hours. Catering supplies and equipment must be removed from the building immediately after the event is over. Temperature—The A/C is normally off in McMurtry Auditorium, unless a request is made through FE&P. Shades—The 3rd floor shades are normally closed but can be adjusted by FE&P to control the amount of natural light in Martel Hall and in the immediate area. Copyright © 2019 Events Office. Powered by WordPress. Theme: Ample by ThemeGrill.